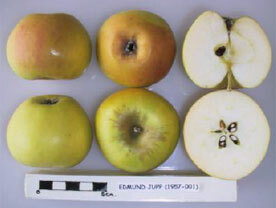 The Edmund Jupp apple was grown in the Horsham area and first recorded as a variety in 1862. It is currently cultivated as part of Brighton Permaculture Trust’s National Collection in Stanmer Park, Brighton. You can see an Edmund Jupp apple tree (planted 2011) in Home Farm Orchard, Stanmer Park ( map). The Edmund Jupp apple is a small to medium sized fruit, flat-conical in shape and slightly ribbed at the base of the fruit. It has yellow skin, sometimes tinged orange with variable amounts of russetting. The flesh is creamy white. Robert Hogg (1851) described it as an excellent culinary apple. The flavour is slightly acid with some sweetness. It ripens at the end of September. It forms a vigorous spreading tree.